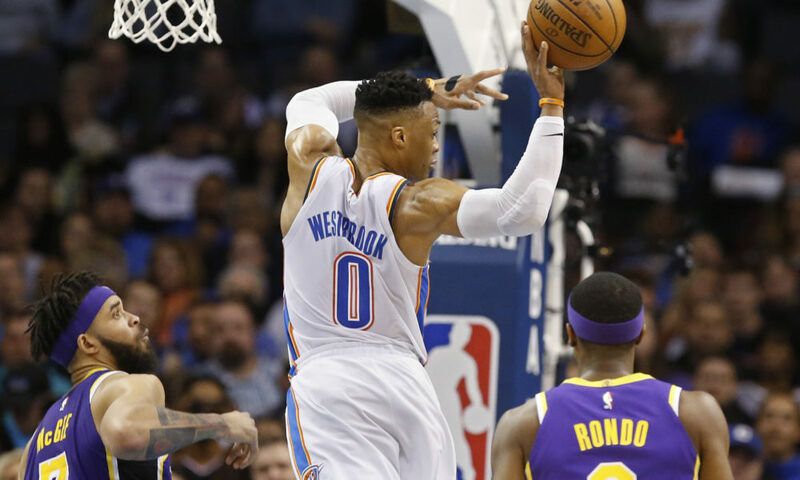 It was a historic night in Chesapeake Energy Arena as Russell Westbrook led the way for the Thunder to defeat the short-handed Los Angeles Lakers at 119-103. Westbrook, who also notched his 31st triple-double of the season, became only the second NBA player in history to have a 20-20-20 game finishing at 20-20-21 since Wilt Chamberlain on Feb.3, 1968. He started the game off with 10 assists in quarter one, and everything fell into place as he snagged the final rebound putting him at 20 on the night with 39.5 seconds left in the game. Fans all over the arena leapt to their feet to show support as Westbrook returned the favor and even yelled out, “This is for Nipsey!” referring to the recent death of rapper/friend Nipsey Hussle. A historic and special night it was, and the Thunder find themselves back in the win column as they prepare to take on the Detroit Pistons on Friday evening for the final home game of this five-game home stretch before hitting the road to take on the Minnesota Timberwolves for the fourth time this season on Sunday. The Thunder advance to 45-33 with only four games left in the regular season and continue to fight for higher seeding in the Western Conference even with a clinched playoff position. Watch below to hear postgame comments from Russell Westbrook and Steven Adams following Tuesday night’s win over the Lakers.